Good morning, Saloners! Last weekend, the entire household here (us plus our parents who are visiting us) headed out northwest on a road trip to Chicago. The whole drive one way is about 12 hours long, and after having done two longer trips last year, one to Miami, and the other to New York/Niagara Falls, we didn't want another reason to sit in the car for a whole day. So this time, we broke it out a bit and stopped at a few places in between. Our favorite state to drive through was, no surprise, my state Virginia. The rolling hills, lush greenery, and the mountainous backdrops never bored us. West Virginia was next - our drive through this state almost completely involved winding through roads between mountains and it was a little queasy after a while. But it was still very beautiful. On the first night, we stopped to have lunch near the University of Charleston. It was a very foggy night and the whole region was just a visual treat. Our not-so-favorite states to drive through were Ohio and Indiana. These states were full of lovely farmlands and the distant landscape had some trees, but after a while, it was humdrum. The landscape did not seem to be moving much. I found it funny that after winding through West Virginia's roads and its mountains, when we crossed over to Ohio, the landscape suddenly flattened out. The trees and mountains disappeared, the roads became straight. Even in the dark, it was obvious to us that the landscape has changed. We stayed our first night in Columbus, Ohio and spent part of the next day walking through Indianapolis downtown. Indianapolis was a lovely city - plenty happening but without the crowd. Of course, it was a Saturday morning, so that could be the reason we were able to walk leisurely. We walked along the canal that I always see in photos from this city and then headed to downtown. This is where we had our best lunch of the trip - at the Le Peep restaurant. All six of us agreed that the food was well worth the long walk we had through the city and the somewhat long wait for the food. Chicago was crowded and a traffic-nightmare, just as I expected. After spending a few days there, I was ready to get out. I guess it's a lot better to live and work in the suburbs than have to head to the main city daily, because we got sick of the traffic and the bad driving we started encountering as soon as we crossed into the city. Seriously, there were cars swaying in their lanes and almost hitting their neighbors. We were in Chicago for about three days, and spent a good chunk of that time walking. Boy, are our legs sore! Two of our very good friends who stayed near Chicago joined us on our city tour. We walked along the Navy Pier, then walked to the Millenium Park, and back to the Pier because that's where we parked. Parking fees cost a fortune, so we had to find ways to go cheap. Chicago was certainly more spacious, less crowded, and cleaner than New York. Some of the suburbs I visited, however, looked neglected. There were blues music festivals and rock concerts going on in open-air stadiums and amphitheaters while we were there. Food is usually the main reason I love road trips. I spend as much time deciding where to eat as I do making the itinerary. Sadly, food in Chicago was lackluster. I'm pretty sure that's because we didn't go to the right places, but after a lot of walking, none of us wanted to walk more miles to eat some food. Deep dish pizza was meh. We had some sandwiches in the Cosi restaurant that was pretty good, and there was a little Thai place we walked into more because it was closer than because we were expecting anything great that turned out to have some great dishes. The lake and river boat tour we did was the best part of our trip. The tour took us out into the Michigan lake, from where we got an awesome view of the city's skyline. This city certainly takes a lot of pride in its history. Oh, and the Skydeck we visited was amazing too. It was super exhilarating to stand on a piece of glass and look down into the ground straight below, about 1350 ft of a drop. Yep. 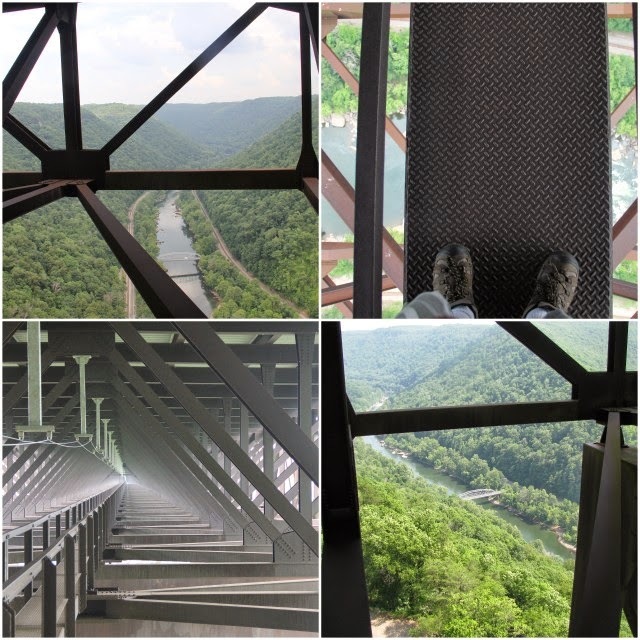 On the way back, we stopped at Beckley, West Virginia, and enjoyed a walk through the inner structure of the New River Gorge Bridge. When I told my family that we were going to be walking under the bridge, they imagined walking on the ground, like it was a big deal. And then we were taken to the interior structure just under the main bridge, a whole 851 feet about the river and they were looking at me like I was nuts. We all did it, however. The views around were wonderful, and there were even some falcons nesting in the bridge who were resolutely holding their ground when we tried to pass. It was killing to go back to work the very next day. Having had much less sleep than usual during the trip, I was nursing a headache while also handling the backlog of work that had piled up in the three days I was out. But it's the weekend again now and that has helped. I also have a lot of neglected house and online chores to do, and that's been my main focus over the last couple of days. Hopefully, things will get back on track from tomorrow, which should mean more reading and blogging. What have I missed in bloglandia? I typed a very long comment to your lovely post which Disqus seemed to swallow whole. Suffice it to say I think your observations are spot on about this sometimes wonderful/sometimes frustrating city. Glad you could see it, though! Glad you returned safely from the dreadful drivers! What a wonderful trip! My daughter just booked a job that will take us to Chicago later this summer and I so hope I have time to see some of the city! It sounds like you had a wonderful time, Athira. It's been too long since I last went on a road trip. I think stopping along the way to see the sights makes it all the more worthwhile. Nothing beats a good road trip... yours sounds amazing! Sounds like a great trip, even if you are paying for it in headache afterward. :p I have no idea what's been going in bloglandia myself -- I've been off doing sister-marriage-related things all week, and we're only now coming down from it. I intend to sleep all weekend. I know! DC is a much much better metro. Not too crowded. Beautiful. Clean air. New York and Chicago are pretty much the same to me, the only difference is New York is cramped, while Chicago is more spacious. Ergh.. Stupid commenting systems that do that. I have sort of trained myself to Copy each comment before submitting it because it happens so often! It happens to me most often on Wordpress blogs, but others are right behind. Oh I hope you will enjoy it! There is certainly a LOT of art in this city. It was certainly a wonderful trip. We don't do too many road trips, so it was nice to be able to do one now. Sleep all weekend sounds perfect to me. Just what I'd like to do too! I think I need a Chicago trip soon. :) I hope you get to go! Wow, that's so neat (and also a bit scary looking) that you can walk underneath the bridge! I will have to remember that if I find myself visiting West Virginia. Looks like you had a great road trip. I love the falcon pic, you got pretty close. We did. We were standing at the same spot for a good half hour waiting for the falcon to move on. We didn't want to get too close in case it felt threatened and decided to peck us or, worse, call its entire family. Thanks to that, we got a nice long photo op. It's really cool! I loved it the second time as well. There is just so much beauty around you. Hope you get to visit it.